Servicing Phoenix with dumpster rentals across the metro area. By keeping prices low and customer service high, Discount Dumpster is your reliable source for dumpster rental services. Our team of trash professionals is ready to help you decide what size container you will need and at the price that fits your budget. Call us today. Renting a dumpster can be a crucial first step for your construction project. Our team understands the importance of delivering on time and being a dependable resource for your project. We strive to deliver prompt service at a low cost to our customers, and that’s what keeps us busy! Small dumpster size is best for small remodel jobs, minor landscaping, spring clean, and junk removal. The shorter sides allow for easy dumping over the top. We’ve been actively renting dumpsters in the Phoenix market, and we’re able to offer low prices and reliable service to our customers. With our wide range of sizes available, our customers benefit from the variety of dumpsters that we’re able to deliver. Discount Dumpster takes pride in making our customers happy so they keep coming back for more dumpsters. We are delivering dumpsters all across the Phoenix Metro Area. Our experienced staff can help answer your questions about which size might be the most appropriate and what price to expect so you can budget accordingly. Ordering the dumpster is simple and our service is always prompt. Call us now to discuss your Phoenix dumpster needs! In the City of Phoenix the Development Division oversees permitting for building and associated permitting. The Office of Customer Advocacy (OCA) was created to assist with customers and will help guide you through the dumpster permitting process, if one is necessary. To avoid the need of pulling a permit it is best to place the container on a firm surface off of the public right of way. The most common location is a driveway or parking lot. The dumpsters are safe to place and will not harm your concrete or asphalt. What can we put in the dumpster? What size dumpster rental should I order? The easiest way to figure out what size dumpster rental you need is to just give us a call! Tell us about your project and we’ll recommend the best size for you. 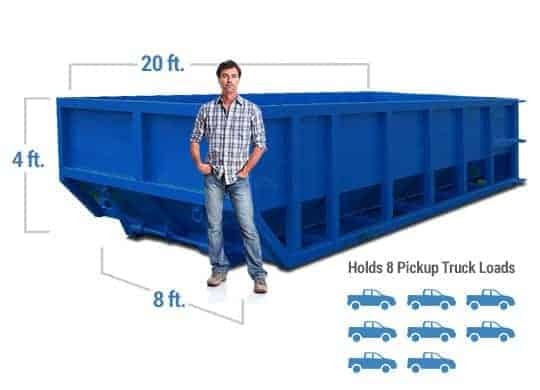 To keep things simple, we break down our dumpster sizes in terms of pickup truck loads. A 10-yard dumpster is the equivalent to about four pickup truck loads. The 15-yard dumpster holds more like six pickup truck loads. 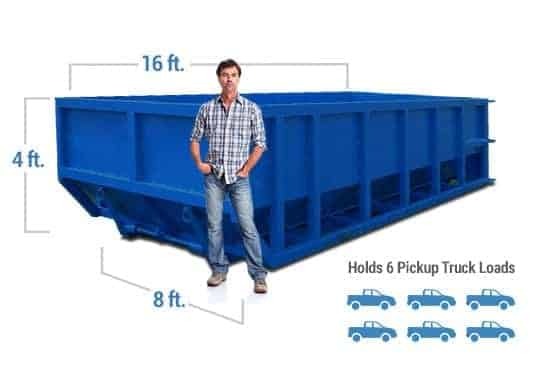 If you are performing a DIY remodel of a bathroom or kitchen, you’ll probably need a 15 to 20-yard dumpster. If you’re planning a move and needing to get rid of a lot, maybe you’ll need more.